What is AT Day at the Capitol? 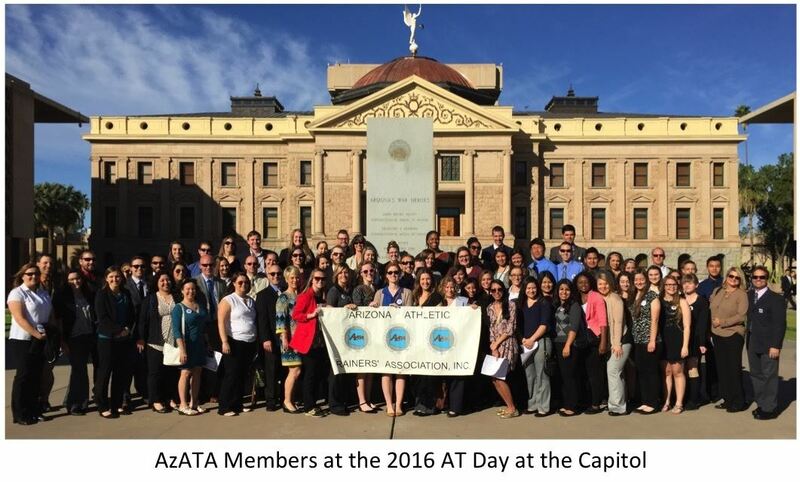 In addition to the Lunch on the Lawn from 11-2pm, the Arizona Board of Athletic Training will hold their monthly in-person meeting on Thursday, March 7th at 9:30am to coincide with AT Day at the Capitol. AzATA Members attending AT Day are encouraged to attend the ABAT meeting if available. Click on the Column header "district" to list by district and note the Senator and Representatives for your legislative district. Take the time to click on the names of your legislators in the member roster. In most cases, their websites will include a picture and a brief bio that contains information about them. Read the bios of each legislator for bits of information that might become useful in conversation. You never know what connection you might have to one of your legislators! Now that you know your legislators, send them an email to personally invite them to join us for Lunch on the Lawn - you can use the template below to reach out. Even if you cannot attend the event yourself, please consider inviting your legislators - the more ATs and Legislators we can get to attend the event, the better! Turn LEFT onto Jefferson, then make left into parking at Wesley Bolin Memorial Plaza. Go through intersection of Jefferson & 17th Ave, then make left into parking at Wesley Bolin Memorial Plaza. Free Parking is available in Wesley Bolin Memorial Plaza which is east of the Capitol. To access the Wesley Bolin Plaza parking, head west on Adams Street towards 17th Avenue or east on Jefferson Street towards 15th Avenue. Free parking is also available in the Executive Tower parking lot on 19th Avenue between Adams and Jefferson Streets.